Oxford Walking Tours have been operating from the blue gates of Trinity College on Broad Street for over 30 years. Our University educated guides come with years of experience and local knowledge of the City and University. 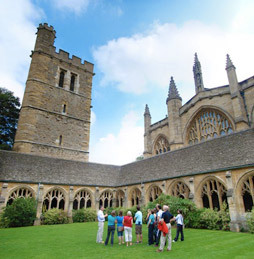 The day tours go into the oldest colleges including New College, founded in 1379, and seen in the Harry Potter films and television productions of Inspector Morse and Lewis . 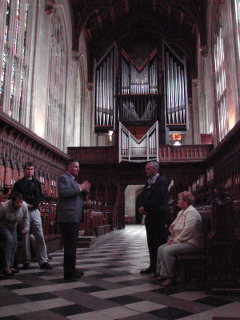 Exeter College is visited on most tours, was founded in 1314 and is seen in the final episode of Morse . Balliol College, founded in 1263, educated more 20th century British prime ministers than any other college. All tours go to the University Library. On our tours you will learn about the history of the city and the university. We will explain the collegiate system of tutorial unique to Oxford and Cambridge. Discover the famous alumni who studied and taught at the university. Go inside the oldest college dining hall, chapel, cloisters and quadrangles. The duration of the tours is 90 minutes and involves less than one mile of walking. Tickets can be purchased from the guide prior to departure; however, numbers are limited. Must have valid Oxford student ID Card, Alumni Card or proof of address to be eligible for Oxonian discount. College admission not included in Ghost Tour as colleges are closed in the evening. If you are the only person on a Student Life Tour, a single person supplement of £40 is applicable. This will be refunded at the time of the tour if there are subsequently additional participants. Optional college admission fee for private/group tours may vary depending on which college(s) you would like to visit – please indicate any preference. are available throughout the year with the price of the tour depending on group size and tour length. For instance a tour for up to 25 people would require one guide at a cost of £125.00 per guide. This is for a standard 1½ hour tour with an optional additional fee of £2 per person for college admission. Please state when booking which language you would like your guide to speak, if other than English. Larger groups, longer tours and themed tours are available on request. We can also offer walking tours in London and Cambridge. Stu’s tour was filmed by the BBC programme Escape to the Country first broadcast on 5th January 2012 (see it on iPlayer). Back in 1998, Andy’s tour was filmed for the BBC Holiday programme. Read full article from The Cherwell student newspaper.